“Medical Tourism Research: Facts And Figures 2012”, the latest report from medical tourism expert, Ian Youngman, puts the medical tourism sector in perspective and offers valuable insight into the size and nature of the current medical tourism market. Few of the oft quoted ‘facts’ about medical tourism are close to being accurate. Much has been written about medical tourism. And many myths have arisen around it. Millions of people flying from country A to country B for cheap medical treatment.... exponential growth in medical travel.... the solution to escalating healthcare costs in the developed economies.... and so on. 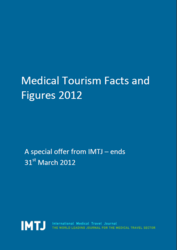 The new report , “Medical Tourism Research: Facts And Figures 2012”, separates fact from fiction. In most cases, medical tourism is regional not international, and often within a country. Many medical tourists do not seek out the cheapest destination. The three most popular European destinations are also the most expensive ones. The USA attracts as many inbound medical tourists as it generates outbound medical tourists. Most medical tourism is for cosmetic, dental or fertility treatment. The 2012 edition of Medical Tourism Facts and Figures has over 500 pages of updated information, including data from countries where no figures were previously available. All figures are analysed for truth or fiction, and gaps in knowledge are highlighted. For each of the 137 listed countries, the report provides (where available) an overview, basic country facts, medical tourism numbers in and out, targets, destinations and sources, research reports, promotional bodies, plans and problems. For anyone wanting the real picture of the vibrant and expanding medical tourism industry, or who wants to avoid the mistakes of others, the new report is a must read. The report normally costs £900, but is available at a discounted rate of £800 until 31 March 2012 through International Medical Travel Journal. Ian Youngman is a writer and researcher specialising in medical tourism, healthcare and health insurance. He writes regularly for a variety of magazines, newsletters, and on-line services. He publishes a range of market reports and undertakes research for companies. An ACII, with an honours degree in Economics from the University of Liverpool, Ian was a co-founder of The General Insurance Market Research Association. He also has widespread experience within the insurance industry at management level, working for brokers, a bank and an insurance company. International Medical Travel Journal is the leading business to business journal for the medical travel and medical tourism sector. IMTJ publishes a regular newsletter to around 15,000 people and provides involved in medical travel.IMTJ is published by Intuition Communication Ltd.